March 19, 2012 - Pavtube Studio has updated its Blu-ray ripping software to support 3D Blu-ray Discs. This new feature enables users to rip and convert 3D Blu-ray movies to 2D video formats including but not limited to MKV, MOV, MP4, M4V, VOB, 3GP, FLV, SWF, TS, and AVI. 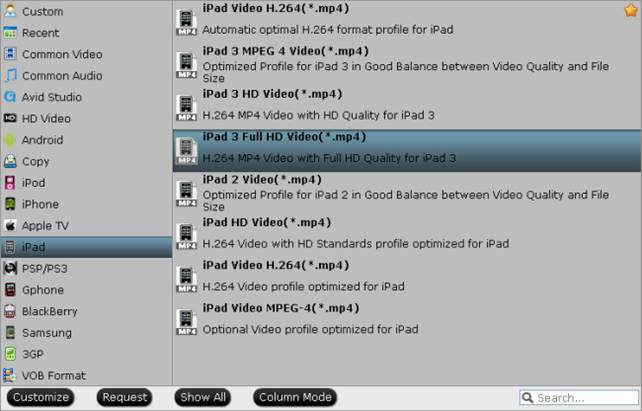 Besides the release of 3D Blu-ray support, Pavtube also added optimized presets for the new iPad 3 to satisfy more user requirements. By using the default presets, consumers are able to output three video types for the new iPad 3 to enjoy different watching experiences, including 640x480 .mp4 video, 720p HD .mp4 video, and 1080p Full HD .mp4 video. - Added support to 3D Blu-ray discs (Blu-ray 3D to 2D). - A fix to Full Disc Copy with Blu-ray ISO files. The new updates are available for both Windows and Mac platform and are free of charge. Users running Windows OS can get software updated by letting the software detect and access latest version from Internet. Users running Mac OS can contact macsupport@pavtube.com for software update. Pavtube Studio creates expert multimedia software applications that help consumers simply access, transfer and share their digital contents(BD/DVD, iTunes movies, camera videos or other media contents)across different devices that range from PC, Mac, tablets, smartphones, to HD media players, game consoles, and home theaters.